Check off each item on the inventory report, as it is located. Place a white FY 2019 inventory sticker on the equipment, as it is located. This will eliminate counting it again if it is moved to another location before the inventory is complete. PLEASE CORRECT ALL MISSING OR INCORRECT DATA ON THE INVENTORY REPORT, I.E. DESCRIPTION, MANUFACTURER, MODEL NUMBER, LOCATION CODE AND SERIAL NUMBER. PLEASE NOTE: THE LOCATION CODE MUST BE VALID ON THE UNIVERSITY LOCATION TABLE. TO FIND THE LOCATION CODE, LOG IN TO CIS, CLICK ON LOCATION CODES LOCATED UNDER RESOURCES & INFORMATION IN THE FINANCIAL & BUSINESS SERVICES PAGELET. IF YOU HAVE QUESTIONS REGARDING VALID LOCATIONS, PLEASE CALL PROPERTY ACCOUNTING AT EXT. 1-3973. The Column headed “COND” (for condition)should be used toindicate current condition of the asset. Please use the following codes. Capital equipment that is coded “P” or “O” must be considered for disposal by transferring the asset to University Surplus & Salvage. Under-utilization of assets is a serious audit consideration and is to be avoided. Assets being used off campus must be listed on a completed Off Campus Authorization Form, a copy of which must be on file with the Property Accounting Office. The University location code of the responsible person should be listed on the inventory, rather than the off campus address. A list of capital equipment our office currently shows as being off campus will be included with the inventory report. Please make necessary adjustments to bring our records up to date and return a copy to our office. If you locate equipment on your inventory report that doesn’t have an asset number affixed, please request a duplicate asset number sticker from Property Accounting. If you locate equipment that is not listed on your inventory report and you have reason to believe it had an original acquisition cost in excess of $5,000, please complete either Form A or Form B. 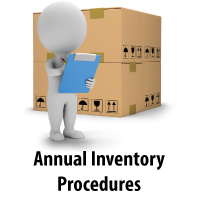 Form A is for assets that do not have inventory numbers affixed. Form B is for assets that do have inventory numbers affixed. Check the equipment on all sides and bottom before listing it on either Form A or Form B. Fill in ALL of the information about the asset. If necessary, make estimates (as accurately as possible). Incomplete data cannot be accepted. Be sure to obtain the department chair or principal investigator’s signature. If there are assets on your inventory report that were purchased from your departmental funds, but are in the possession of another department, a Retirement/Transfer Form should be processed. For inventory purposes, control of capital equipment is the responsibility of the department that has the equipment in their possession. If you cannot locate assets shown on the inventory report, please follow theseprocedures, before reporting them as“lost or cannotlocate”. Look at last year’s inventory to make sure it was found previously. Inquire of people in the same general area if they have knowledge of the asset’s location. The asset was stolen and should be reported to campus police. If, after considering all of the above without resolution, the asset should be reported as “lost or cannot be located” on a Retirement/Transfer Form. Property Accounting will send a new report to the department listing the assets meeting the “lost” criteria. The department chairperson will provide certification of the steps taken to locate the missing assets. The cognizant Dean/Director and the cognizant vice president will approve the certification statement of the department prior to returning the report to Property Accounting. Only after completion of the certification process will the assets be removed from the department’s inventory. The person responsible for maintaining the departmental inventory records, as well as the Principal Investigator, must sign the certification label on the last page of the inventory prior to it being returned to Property Accounting. Certification indicates compliance with all rules and regulations pertaining to capital equipment including that all inventory items are in full utilization. Certification also indicates that there is no instance of capital equipment in your department’s possession that has not been properly recorded in the University’s inventory database. This includes government-furnished equipment, as well as, equipment transferred to the University from another institution. Please make a copy for your files and return the original inventory report, Forms A and B, Off Campus Approval Forms and any Retirement/Transfer Forms to Property Accounting, 416 Park Building. If you have any questions, please call either extension 1-8673 or 1-3973.